DISCLAIMER: Spoilers for “Furious 7” are afoot in this article. Proceed with caution. In the wake of the death of one of its stars, the “Fast and Furious” franchise made a relatively difficult decision to continue producing its latest installment of the now seven-part saga. While some might take a sympathetic approach and say the movie would be considered good simply because Paul Walker died during filming — effectively biasing the audience — that is not true. Rather, the film is a good one not because of the hype, but because it is well made. On that subject, audiences undoubtedly held their collective breath throughout the duration of the movie, waiting for Brian O’Conner (Walker)’s inevitable death, which never came — not on screen, not off screen. The producers and writers of the movie chose to pay tribute to Paul Walker in a different way. They chose to make it seem like Walker’s character chose to be with his family after this last job. In fact, there are several places the writers could have taken the easy way out and killed off Walker’s character, but they opted instead to ask his brothers to fill in as body doubles to finish the scenes he had not filmed. In regards to the bulk of the movie, it is just as good as any of the other “Fast and the Furious” entries, and just as packed with explosions and car crashes — including driving a car of an extremely tall building into another (and repeating it once more) and having a person jump out the window of a speeding car into the open window of another speeding car that’s going in a different direction. Obviously several actions scenes are not really physically possible in real life, but they are still fun to watch. Considering this job was originally supposed to be personal because Shaw is now targeting members of the team — including Hobbes (Dwayne Johnson, Hercules), who he ends up putting in the hospital for the bulk of the movie. The plot of the movie fits in with the tragedy that happened during the production of the movie itself. Several death defying scenes almost make viewers cringe, thinking, “How on Earth are they going to survive this?” Other scenes make the audience laugh. And before anyone gets too excited or too worked up, Iggy Azalea spends all of five seconds on screen, having only one line, towards the beginning of the movie. 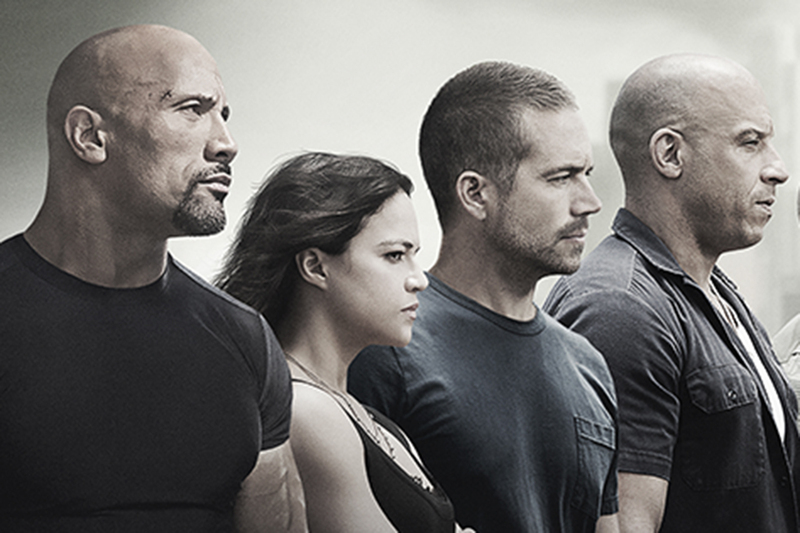 At the end of the day, “Furious 7” is both action-packed and extremely emotional. As personal as the job is, and as personal as the movie is to everyone involved, it still managed to be as action-packed as previous movies. This go-round is definitely a must see movie for fans of the series.